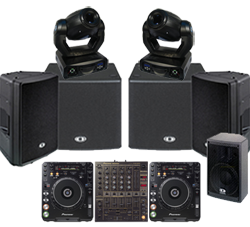 One of the key elements in any Disco is the equipment and the quality our equipment is something we take seriously. We invest heavily in our equipment as there is no use in having an excellent DJ if you are let down by the equipment just when it is needed most - in the middle of your party. All of our equipment is P.A.T. tested to ensure that it is all safe and we regularly service all equipment in order to keep it fully functional - all of our engineers are trained to make most repairs and every piece of equipment is checked prior to being loaded for transport to the venue. Essential items are also backed up with spares so if the worst were to happen it can be swapped out with the mimimum of fuss and all our DJ's are trained in how to do this. 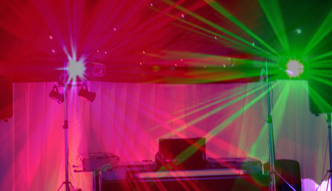 We don't believe in listing each and every item of equipment here on the website as we will send the equipment most appropriate to your venue (if you require a list for any reason, please feel free to ask and we can provide one) - however each of the roadshows provides a lightshow to wow your guests and a sound system that produces crystal clear sound with amplifiers that are matched to the speakers being used to ensure clarity is maintained at all levels. If we are playing at a large venue then the sound system will be increased to take into account the different accoustics, if your venue allows smoke machines, lasers, strobe lighting etc then these can also be provided. Most of our roadshows come built with the lighting setup behind the DJ. All the structure and cabling is hidden from view by a black "Star-Cloth" providing a sophisticated, professional and tidy appearance. If you are looking to use a larger venue and wanting a system with more of a night club feel we can provide a fully rigged mini-nightclub which is rigged to fit around the dance floor. The mini-nightclub rig can hold strobe lighting, intelligent lighting, UV Cannons, Lasers, Smoke Machines as well as providing a structure if you want to uplight the ceiling or walls of your venue. This rig only fits in rooms with higer ceilings or larger marquees, please Contact Us for details of how we can provide your venue with the roadshow that it deserves.